And so begins The Truth Is a Cave in the Black Mountains, a haunting story of family, the otherworld, and a search for hidden treasure. This gorgeous full-color illustrated book version was born of a unique collaboration between New York Times bestselling author Neil Gaiman and renowned artist Eddie Campbell, who brought to vivid life the characters and landscape of Gaiman's award-winning story. In this volume, the talents and vision of two great creative geniuses come together in a glorious explosion of color and shadow, memory and regret, vengeance and, ultimately, love. 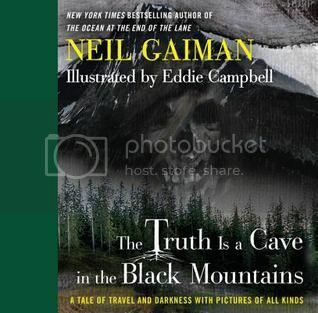 The Truth is a Cave in the Black Mountains by Neil Gaiman is totally unlike anything I’ve read before. Not only have I never read a graphic novella (or novel, even) before, but the story itself is of a totally new-to-me style. Maybe I should just pause to mention that this was my first Gaiman experience, too. Throughout the read, we witness a journey between two men—I won’t say gentlemen, as I’m unsure they’re good candidates for the title—and from the very first moment, the reader is kept guessing as to the grander scheme of things. And the farther these two men journey, the more snippets of clues are dropped, in tales they share with each other, in narration shared with the reader alone, until we near the final stretch of their travels to this almost mythical location and the puzzle pieces all rearrange themselves in our mind to reveal a bigger picture. And I loved this about the story. I loved how we received just the right dose of everything at exactly the prescribed times, enabling us to follow along without even realising we’re doing so. More so, I loved how the images accompanying the story added such a vivid vibrancy, despite the dark undertones of even that aspect of the book, and I loved how those, coupled with words, ensured I could ‘see’ their journey every step of the way. I would say, however, that the label of ‘graphic novella’ alone doesn’t really do the package in its entirety enough justice. Because the images are outstanding, and outstandingly fitting. It was like having a shadowed and twisted kiddies picture book in my hands—but for adults—one presented with such amazing quality, it has earned its rightful place upon my bookcase, where it shall likely live until I deem another worthy of handing it down to in my grandmotherly years.